The Twante Canal is a canal that connects the Irrawaddy River and the Yangon river in Myanmar. 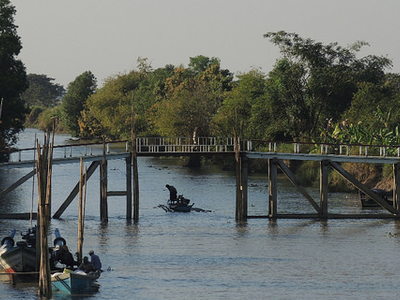 The 35 km (22 mi) canal is a heavily used short cut between the city of Yangon and the Irrawaddy Division. The canal is named after the town of Twante, located near the canal's mid-way point. The canal was the quickest route from Yangon to the Irrawaddy Delta until the 1990s when roads between Yangon and the Irrawaddy Division became usable year round. The canal is still heavily used. Due to the lack of regular maintenance, the canal has become silted and narrower over the years. In 2010, the mouth of the canal was widened by 600 feet (180 m). However, plans to put in concrete embankments were yet to be carried out, and the navigation problems still remain. The construction work on Twante Canal began in 1881 during the British colonial rule. The canal was opened in May 1883. The Twante Canal shortened the distance by the Kanaungto creek between Yangon and the To river. The Irrawaddy Flotilla Company, Ltd., which handled nearly all inland carrier traffic in British Burma, ran daily services from Yangon to the Irrawaddy delta and Upper Burma. In 1935, the canal was widened and deepened to allow for the Irrawaddy Flotilla Company's large steamers to Mandalay. Previously larger steam ships had to go out the Yangon River and up one of the larger mouths of the Irrawaddy. Here's the our members favorite photos of "Canals in Yangon". Upload your photo of Twante Canal! So far only Hein Pyi wants to visit Twante Canal. Do you want to visit Twante Canal Click here?